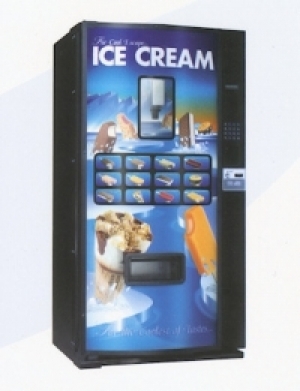 Specified by major ice cream manufacturers worldwide / Up to 450 unit capacity / Up to 18 selections / Vends all shapes and sizes up to 1.4kg (3lbs) in weight / Electronic multiple pricing / Unique robotic dispensing system / Machine always looks full / Simple and fast loading system / Bins protect products from thermal shock / Unlimited product configuration options / Optional graphic or dummy product displays. 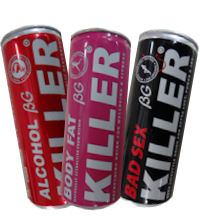 Compatible with all major coin and cashless systems / Simple refrigeration requiring no mechanical maintenance / No moving parts in freezer / Extended life during power cuts / Minimal temperature loss during loading / Forty character alpha numeric display / External auditing / Menu driven user friendly software. Back lighting for graphic display. Scrolling L.E.D. display for superior merchandising. Max. 18 selections Max. 450 items Up to 3 lbs (1.4 kg) Up to 8" x 6" (203 mm x 153 mm) 230 volts 50Hz, 13 amp fused. 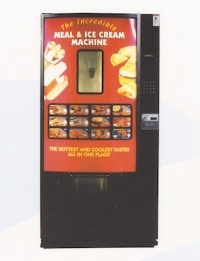 You can view the brochure for this ice cream vending machine by clicking on the link below.